What Day Of The Week Is August 31? 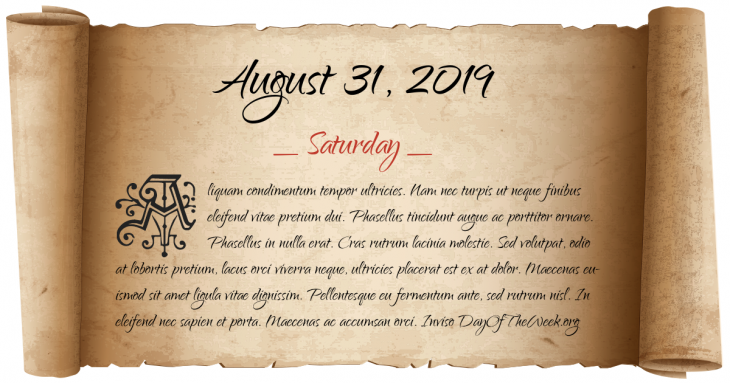 August 31, 2019 is the 243rd day of the year 2019 in the Gregorian calendar. There are 122 days remaining until the end of the year. The day of the week is Saturday. After a sudden illness a few days previous, Byzantine Empress Theodora dies without children to succeed the throne, thus ending the Macedonian dynasty. Pennsylvania Central Airlines Trip 19 crashes near Lovettsville, Virginia. The CAB investigation of the accident is the first investigation to be conducted under the Bureau of Air Commerce act of 1938. The USS Harmon, the first U.S. Navy ship to be named after a black person, is commissioned. A parcel bomb sent by Ngo Dinh Nhu, younger brother and chief adviser of South Vietnamese President Ngo Dinh Diem, fails to kill King Norodom Sihanouk of Cambodia. After two weeks of nationwide strikes, the Polish government was forced to sign the Gdańsk Agreement, allowing for the creation of the trade union Solidarity. Thai Airways Flight 365 crashes into the ocean near Ko Phuket, Thailand, killing all 83 aboard. Who were born on August 31?